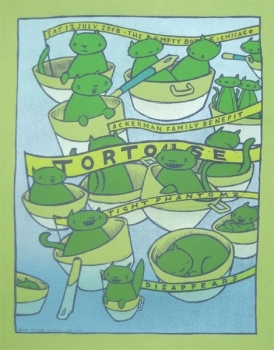 A few years ago, in a silkscreen course at Western Illinois University, I was introduced to Chicago-based screen print artist, Jay Ryan. My professor challenged the class to create prints inspired by Ryan's work, particularly his choice of colors and subject matter. This challenge included use of rubylith and the application of a split-fountain, or rainbow roll, color scheme. From this assignment came one of my favorite prints to date, Kelly's Squid Salon. 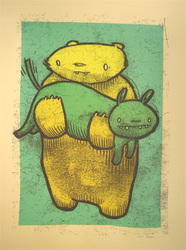 Coinciding with the assignment was an exhibition, Jay Ryan: Prints from The Bird Machine, at the University Art Gallery. 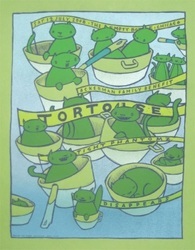 I remember viewing Ryan's prints and appreciating the loose line work of his hand-drawn characters. Many of his prints feature animals personified in humorous scenes. 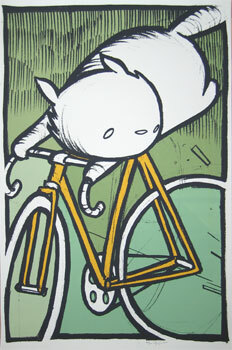 For example, a cat riding a bicycle. 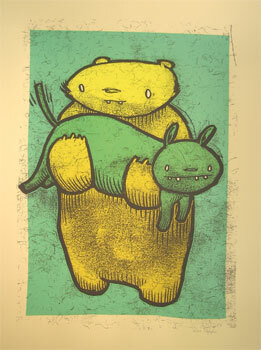 I've continued this theme in my own prints, inspired by my relationships and experiences with others. For example, an alpaca wearing over-sized sunglasses and a large clock necklace is a character inspired by conversations with my sister Caitlin. I had the opportunity to hear Jay Ryan speak at the 2011 Illinois Art Education Association conference. He presented images of his work throughout the years and told stories of how he began screen printing as well as his upcoming projects. 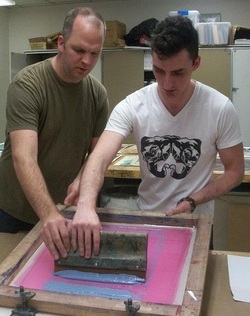 I was also fortunate enough to attend a workshop where he explained his process and produced a three-color screen print with each individual. 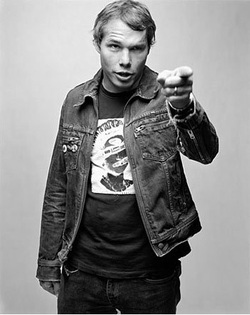 I learned about Shepard Fairey while taking an introductory graphic design course at WIU. 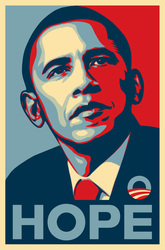 I was introduced to his work during the height of fame and controversy surrounding his Obama print. The posters struck a chord with millions of people, and I too became a fan instantly. I loved the breakdown of shapes within the portrait and the limited color palette as well. The print appeared simple with a straight-forward message, but managed to carry a profound impact during the 2008 Presidential election. 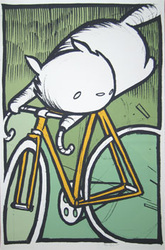 That summer I created a series of woodcut prints heavily-influenced by Fairey. 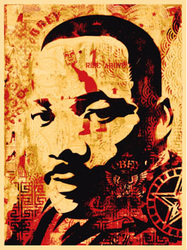 The prints feature four of my favorite U.S. Presidents: Lincoln, FDR, JFK, and Obama. Using few colors, I mimicked Fairey's style through my own perception and application. 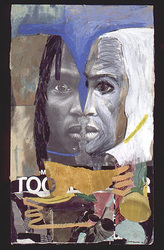 I abstracted the portraits into three distinct values and carved away at each layer. Like many of Fairey's prints, I included one-word captions beneath the portraits to describe the individual's character and legacy. Fairey's general approach to design has also greatly influenced my work. Whether I'm creating an advertisement, flyer or newsletter, I continue to practice the philosophy that less is more. 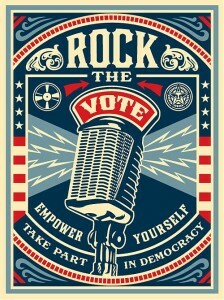 Many of Fairey's prints are straight-forward with an intended message. I too attempt to communicate as much information I can in very few words. My accompanying graphics are primarily black and white with the occasional splash of color. 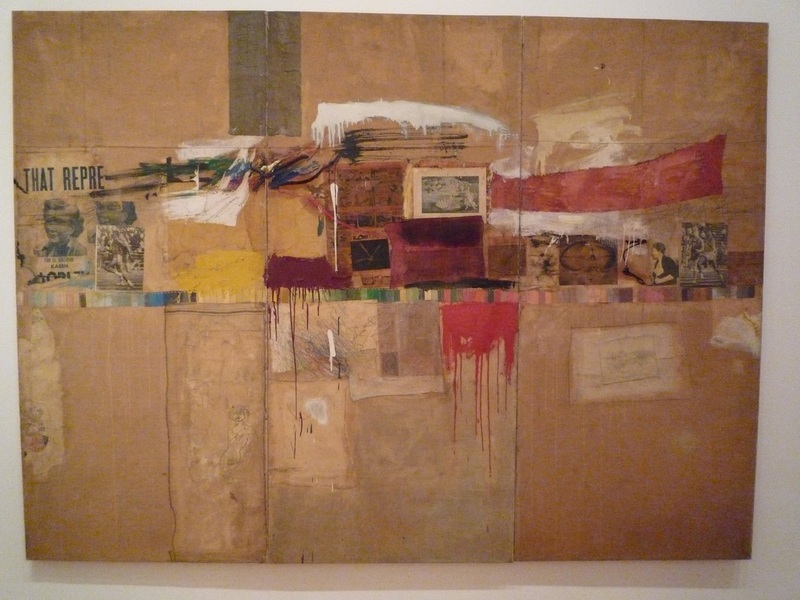 I first read about Robert Rauschenberg in my high school art class. I still remember seeing a photograph of Monogram in our textbook. A photograph of the construction was included to question students' interpretation of fine art. Today, I know Monogram was one of my first introductions to a formal aesthetic evaluation. Although this construction did not directly influence my artwork, it has influenced how I will incorporate contemporary art in the classroom. Monogram was only my introduction to Rauschenberg. 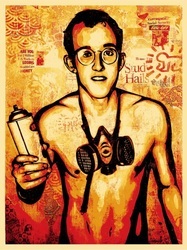 Years later in art history courses I discovered how incredibly talented he was in a wide variety of art media. 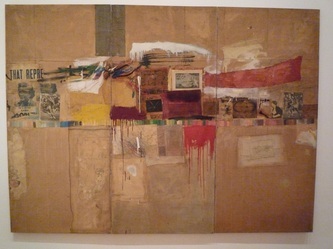 His combines of painting and sculpture may be his best known work, but I have found his collages to be the most interesting. 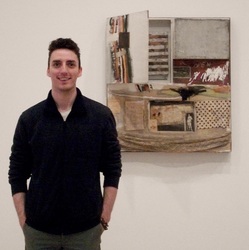 I am fascinated by how he was able to create unified artworks from appropriated images and original photographs with elements of drawing and painting. In my own artwork, I've taken a cue from Rauschenberg and made several collages combining drawing and painting with printed reproductions. I first practiced the technique in an advanced drawing course at WIU. In my first attempt, I used appropriated images to create a portrait, and failed miserably. Later in the semester, I gave the process another try, but instead I incorporated reproductions of my own sketches. 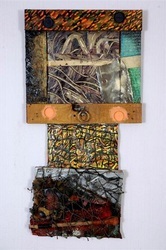 The result led to the first in a series of mixed media collages focused on issues of identity and memory. While studying contemporary art history at WIU, I discovered William Kentridge in the pages of my textbook. 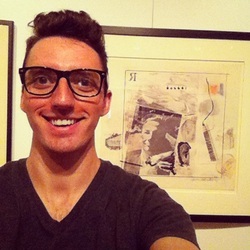 I chose to write about the artist and his animated films for my final paper. Months later the paper was submitted as evidence of written work for admittance into the ISU art education masters program. 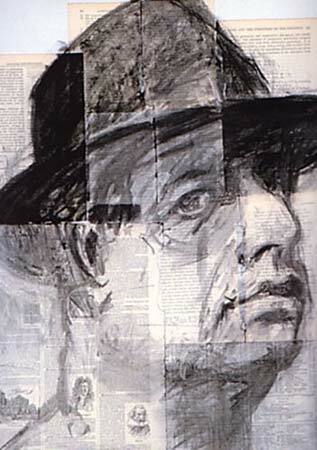 Kentridge's work inspired me to learn more about the artist and his content. I credit the quality of his work for providing strong material to write about. 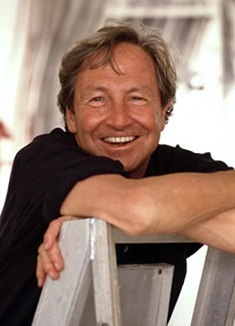 Kentridge is well-known for his animated films. The content of his work is heavily influenced by the social climate of South Africa. Racial segregation was enforced by the government from 1948-1994. Kentridge's parents were both lawyers who defended the apartheid victims. 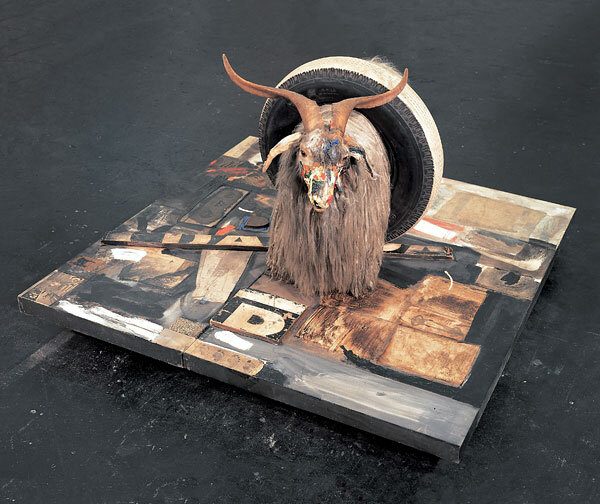 Much of his work reflects the tense social climate following the end of apartheid in 1994. Although I have not yet created films nor do I often depict social/political issues in my artwork, Kentridge has still influenced the art I do make. His use of loose lines and marks, along with dark values are qualities I appreciate and feature in my own drawings and prints. 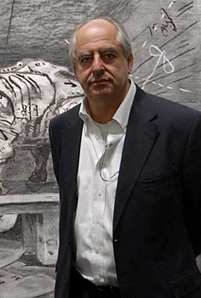 Kentridge is described as an expressionist. His artistic process serves the meaning almost equal to the meaning of the work. Regardless of the media, I let my marks, colors and composition decisions enhance whatever I am trying to communicate to the viewer. Garth Erasmus is also a South African artist. 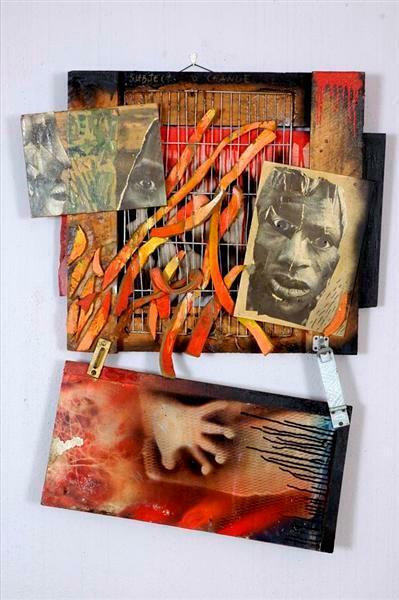 Like Kentridge, some of his work reflects his experience growing up during the apartheid in South Africa. However, his more recent work has focused on more personal matters, discovering an identity by researching indigenous cultures. Erasmus is primarily a mixed media artist, using acrylics with sand along with collages of photographs and drawings. The first time I came across Erasmus was an image of The Muse in my art education textbook. 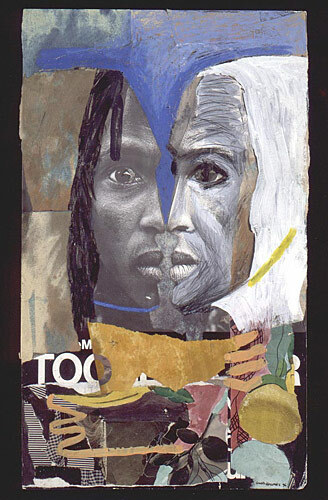 The image was included as an example of artwork focused on the theme of identity. I later looked for more of his work online and found in addition to creating art, he has also worked with a number of schools in South Africa to promote and celebrate cultural diversity. 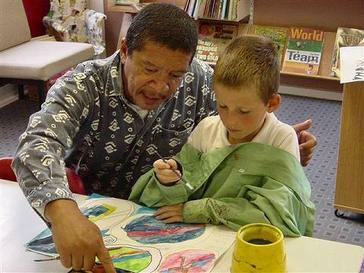 As an art educator, I certainly respect and appreciate his work so much more knowing about his involvement with the arts for children in his community. When I saw Franz Marc's The Tower of Blue Horses in an art history textbook, I immediately fell in love with the bright colors and dramatic lines. 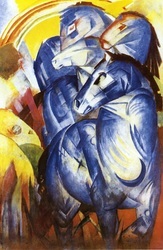 The way he had broken down the horse figures into shapes and vertical lines was incredible. I'm sure in class we read about other German Expressionists. 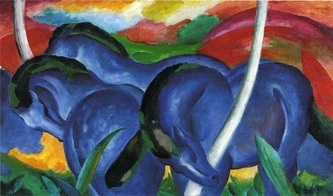 I remember hearing about Marc's role in founding Der Blaue Reiter (The Blue Rider) with Kandinsky. 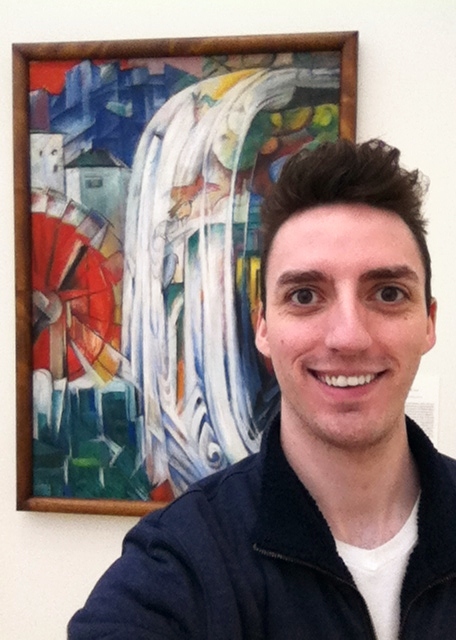 However, the strongest impression on me was seeing images of his paintings for the very first time. I have tried to mimic his style many times and so far, have failed to meet my own expectations. 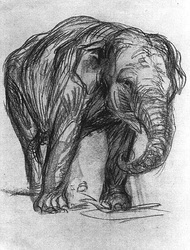 However I have applied many of his methods of abstraction to my work such as arbitrary colors, and use of shapes to describe a figure. 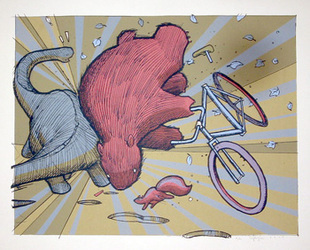 Like Marc, I find the use of animals as subject matter compelling. Marc believed animals to represent a spiritual attitude. He viewed animals as more pure than people. While I don't share his exact views, I often personify animals in my work to convey a story about myself or experience with others. For some reason, I believe characters are more universally relatable to the viewer than the human figure.